They don’t know his life! Mötley Crüe’s founding member Tommy Lee called out a critic on Twitter after a negative review of Netflix’s latest biopic, “The Dirt”. The film is adapted from the band’s 2001 autobiographical book, “The Dirt: Confessions of the World’s Most Notorious Rock Band”. Many critics agreed that the film did not accurately portray the extremities of the band’s antics. Lee specifically clapped back at the writer of the review in Esquire, who claimed the film felt like seeing “the bedtime story version of Mötley Crüe’s reign” compared to the “highly offensive and exceptionally gripping” depictions in the book. Ultimately, the review said the biopic was a waste of time to watch. The band’s drummer did not tolerate the hate and tweeted his response, below. The entire Crüe praised the film as a whole, as well as the performances of the actors who portrayed them. The Dirt was directed by Jeff Tremaine, who’s best known for being involved in the infamous Jackass franchise. 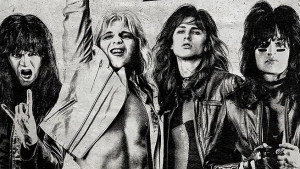 The film stars famous rapper Machine Gun Kelly as Tommy Lee, Douglas Booth as Nikki Sixx, Daniel Weber as Vince Neil and Iwan Rheon as Mick Mars. Lee and Sixx both took the time to give shout outs to them on their Instagram accounts, as shown below. All four band members heavily promoted the release of the film. Vince Mattis @Vincentmattis325 did a 🔪 job playing a young me.Great acting.That scene brought up a lot of feelings for me the first time I saw it. #TheDirt @motleycrue @netflix @gorillaflicks ZOOM IN AND CHECK OUT THE DETAIL IN THE ROOM..Set designers on this movie nailed it. Below is the official trailer for “The Dirt” & you can watch the entire film on Netflix.